The original version of this article appeared on the Environment, Conflict, and Cooperation (ECC) Platform. ECC: How will climate change impact migratory patterns within Mexico and associated security issues? Temperatures in Mexico are rising, precipitation levels are falling, and the increasing frequency and intensity of flooding and extreme weather events pose serious threats to water, food, and energy security. In turn, the availability of and competition over these key resources will alter the spatial distribution of people in Mexico. Our Whitehall Report investigates possible linkages between environmental changes, migration, and its repercussions concerning national and human security in Mexico. Controversial suggestions from the academic cluster have predicted that climate change could drive millions of people to migrate from the effects of severe drought, floods, and extreme weather events, triggering major security concerns and a spike in regional tensions. Such controversial statements really sparked our attention and inspired us to further understand and quantify the climate-migration-security nexus. Continue reading on the ECC Platform. 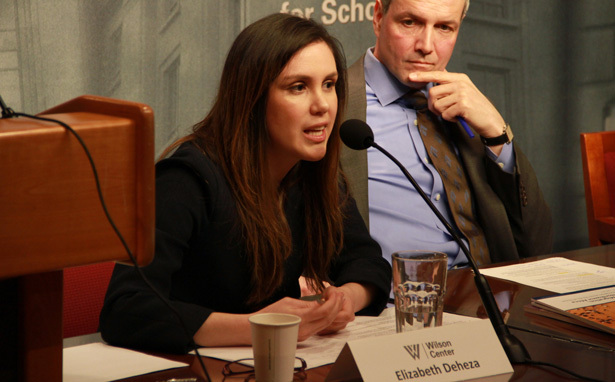 Photo Credit: Elizabeth Deheza at the Wilson Center, courtesy of Schuyler Null/Wilson Center.